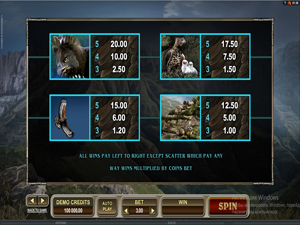 The Untamed: Crowned Eagle video slot produced by Microgaming is dedicated to yet another wildlife creature and is part of the Untamed series. The slot incorporates some fascinating features, among which are scatters, wilds, Lucky Nudge, Collect a Wild and 20 free spins. A 243 ways to win system applied in this game adds action and fun to the gameplay giving a chance to bag a 7500-coin jackpot. The slot’s imagery is detailed in a photorealistic style. 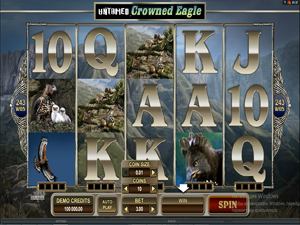 Untamed: Crowned Eagle is played over five reels with 243 ways to win. In this slot, Microgaming has got out of a traditional payline system, and you gain winnings every time you roll up matching symbols on adjoining reels starting from the first reel. As in other 243-way video slots, the number of paylines to bet on cannot be configured. Before every spin, you can make the following bet value adjustments: a coin denomination ($0.01 to $0.2) and the number of coins (max. 15). When playing this slot, you will come across some breath-taking symbols depicting an eagle in flight or a close-up of the eagle’s head. With their flawless design, they look like spectacular photographs. Besides, standard playing card symbols from 10 to Ace are used. Playing cards are less valuable than nature-themed symbols paying out 2 to 80 coins for 3, 4 or 5 of a kind. The highest payout regular symbols award is x200 times a bet, for five Eagle’s Head symbols landed on adjacent reels, from reel 1 to 5. A wild symbol is represented by the Untamed: Crowned Eagle icon that acts as a substitute for all icons, other than scatters. Beneath every reel, there is a progress bar divided into four squares. Whenever a wild icon lands on a reel, a small badge is added to the progress bar of that reel. When a progress bar gets filled up with four badges, the entire reel morphs into wild and freezes in place for the duration of the next four spins. If you are lucky, two or even three reels can turn wild at the same time. The Eagle’s Eye symbol serves as a scatter, with these five awarding the slot’s top jackpot worth a total bet times x7500. Scatters do not need to appear on the adjacent reels to pay. Three or more scatters activate 10 free games. During the free spin round, an amazing Soaring Wild feature gets activated transforming a random symbol into an extra wild. If an extra wild helps create a winning combination, the payout comes at a x2 to x10 random multiplier. Another unique feature named Lucky Nudge can contribute to triggering your best online pokies real money ten free spins. A scatter symbol may sometimes appear a little under the top or above the bottom of a reel as if peeping at the action. If you have two “full” scatters on the reels and one misses to trigger the free spin round, a peeking Eagle’s Eye may be gently nudged onto the reels to become a “full” scatter. The Gamble feature can be activated after every winning spin by hitting the Gamble button. In the Gamble screen you will see a globe split into Win and Lose areas. Before starting the feature you can adjust coverage of the Win area. If you increase the Win area, your winning chances will go up, but the award will be smaller. If you shrink the Win area, your winning chances will go down, but the award will be higher. The Untamed: Crowned Eagle video slot comes equipped with Microgaming’s patented 243 ways to win, realistic graphics and stunning bonus features. These include Lucky Nudge, Collect a Wild, free spins, a wild symbol and a stunning Gamble feature with adjustable odds.